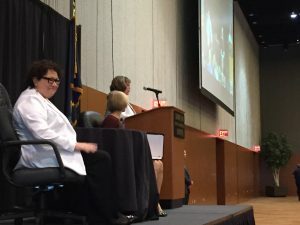 Supreme Court Justice Sonia Sotomayor spoke in Anchorage on Wednesday to a crowd of 1,200 people. While answering preset questions, she spoke about how being nominated to the high court transformed her life, and how different experiences can affect a ruling. Supreme Court Justice Sonia Sotomayor was nominated to the Supreme Court in 2009. She said the process was painful because people publicly called her harsh and questioned her intelligence. Among the downsides of being on the court are she misses her privacy and her ability to get together with family on a whim. Even at the grocery store, she said she is never out of the public eye, and though she’s an extrovert, that’s hard. For Sotomayor, learning from a diversity of life experiences is what makes a strong court. It helps the judges see cases from different perspectives and base their decisions on all of the facts, not just ones they are predisposed to see, she said. She said for her, diversity means more than just differences in gender and ethnic identity, and in some ways, the current members of the Court are all very similar. All of the current justices have ivy league educations, are Catholic or Jewish, and most are from the East Coast. For Sotomayor, it was hard on both a personal and a professional level to cope with the loss of Justice Antonin Scalia’s perspective when he died earlier this year. She described him as a fun, witty older brother who would say the most annoying things. He was also an active participant in oral arguments. After he passed, she said she would fill the new silences with questions. “I had to start containing myself and start living with the slightly longer silences,” she recalled.